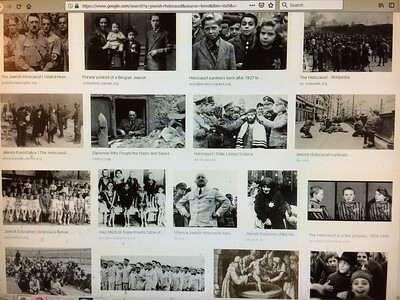 The Holocaust is the best documented case of genocide. Despite this, calculating the numbers of individuals who were killed as the result of Nazi policies is an impossible task. There is no single wartime document that spells out how many people were killed. And in some cases, contrary to popular opinion, records were not kept. “…These estimates are calculated from wartime reports generated by those who implemented Nazi population policy, and postwar demographic studies on population loss during World War II. The term “genocide” is one of those controversial terms that can lead to all kinds of problems. The problem is that the term has been so politicized, and frequently used to attack leaders or countries that one dislikes, that it has come to mean different things to different people. 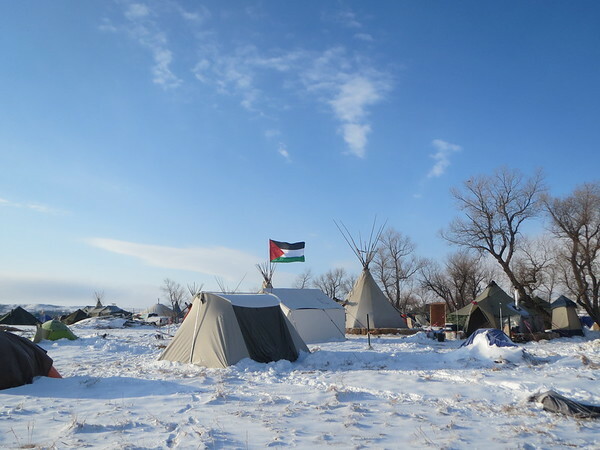 For instance, the term has frequently been used to describe what white settlers did to the Native Americans over the last few centuries, when much of the indigenous population of the United States was wiped out. However, the overwhelming majority of those deaths were due to smallpox being inadvertently introduced into a native population that lacked the biological means to resist it which, while devastating, was not a genocide as it was not done intentionally. “..Heinrich Luitpold Himmler (German: [ˈhaɪnʁɪç ˈluːɪtˌpɔlt ˈhɪmlɐ] (About this soundlisten); 7 October 1900 – 23 May 1945) was Reichsführer of the Schutzstaffel (Protection Squadron; SS), and a leading member of the Nazi Party (NSDAP) of Germany. Himmler was one of the most powerful men in Nazi Germany and one of the people most directly responsible for the Holocaust. ..
. From 1943 onwards, he was both Chief of German Police and Minister of the Interior, overseeing all internal and external police and security forces, including the Gestapo (Secret State Police). Himmler had a lifelong interest in occultism, interpreting Germanic neopagan and Völkisch beliefs to promote the racial policy of Nazi Germany, and incorporating esoteric symbolism and rituals into the SS. .. In August 1941, Himmler attended the shooting of 100 Jews at Minsk. Nauseated and shaken by the experience, he was concerned about the impact such actions would have on the mental health of his SS men. He decided that alternate methods of killing should be found. On his orders, by early 1942 the camp at Auschwitz had been greatly expanded, including the addition of gas chambers, where victims were killed using the pesticide Zyklon B. Himmler visited the camp in person on 17 and 18 July 1942. He was given a demonstration of a mass killing using the gas chamber..
“…After retiring as a professor from the University of Minnesota Minneapolis in 2001, where he was employed for 50 years as a professor of communication and creativity, Fred Amram has spent most of his time in retirement addressing his history as a Holocaust survivor. He’s given lectures to students, military members and government agencies, and published a memoir titled “We’re in America Now: A Survivor’s Stories,” which details his upbringing in Germany and in America. Amram wrote about witnessing the national wave of violent anti-Jewish attacks known as Kristallnacht and the Gestapo raiding his home; he watched British bombers from his balcony, when Jews were banned from air raid shelters; he saw his father forced into slave labor; and he lost extended family members in the ghettos and concentration camps. Amram will speak at the Stevens County Historical Society Museum at 7 p.m. on Tuesday, Nov. 27, and to students at Hancock Schools on Wednesday, Nov. 28, a news release said. He was 2 when the Nazi Party passed the Nuremberg Laws in 1935, which deprived Jews of their citizenship and prohibited them from marrying or having relations with Germans. Fred Amram was born September 19, 1933 in Hanover Germany, where he experienced the early years of the Holocaust. An only child, he and his parents found their way to Antwerp, Belgium in November 1939 before escaping later that month to New York City. For many years the family had no idea the fate their extended families members had suffered until Fred, learned after doing research at Yad Vashem that his 3 ½ year old cousin, Aaltje, and Aunt Käthe died at Auschwitz on February 19, 1943. After attending the New York State College of Forestry and graduating from Syracuse University, he became a graduate student at the University of Minnesota and ultimately a professor of Speech Communication in the University’s General College. He has published three academic books, and dozens of scholarly articles. 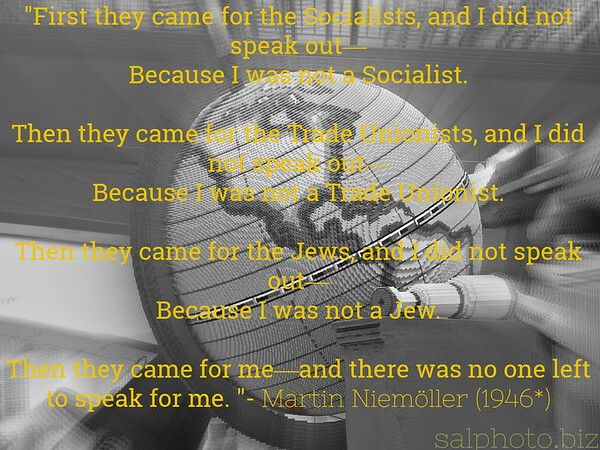 He currently writes about his experiences in the Holocaust and as a refugee in his adopted country. “..“The key thing to understanding [the Holocaust] in Lithuania is the hated occupation by the Soviets as the consequence of the Nazi-Soviet pact,” Rees explains. “Many in Lithuania believed the lie that the Nazis were peddling at the time, that communism equals Judaism and that Jews were aiding the Soviet authorities,” the historian adds. “..The ideology of the movement was a blend of fascism, Roman Catholicism and Croatian nationalism.The Ustaše supported the creation of a Greater Croatia that would span the River Drina and extend to the border of Belgrade.The movement emphasized the need for a racially “pure” Croatia and promoted genocide against Serbs, Jews and Romani people, and persecution of anti-fascist or dissident Croatians. The Ustaše were fiercely Catholic, identifying it with Croatian nationalism. They declared that the Catholic and Muslim faiths were the religions of the Croatian people. They claimed the Islam of the Bosniaks was a religion which “keeps true the blood of Croats”. ..The history textbooks in the Socialist Federal Republic of Yugoslavia cited 700,000 as the total number of victims at Jasenovac. According to the Simon Wiesenthal Center (citing the Encyclopedia of the Holocaust), “Ustasa terrorists killed 500,000 Serbs, expelled 250,000 and forced 250,000 to convert to Catholicism. They murdered thousands of Jews and Gypsies.”..
‘…Just this week, the Serbian parliament apologized for its role in the infamous Srebrenica massacre of 1995 that killed some 7,000 Bosnian Muslims. Such an apology was considered unthinkable even a few years ago, yet the pressures of joining the EU helped nudge that nation to account for this war crime. In 2001, Croatian President Stepjan Mesic apologized to Jews in an address delivered at the Israeli Knesset. In 2003, he joined Serbia’s president in a mutual apology for “all the evils” each side had brought during the Balkan conflict. “..In May 1993, the U.N. Security Council created the International Criminal Tribunal for the Former Yugoslavia (ICTY) at The Hague, Netherlands. It was the first international tribunal since the Nuremberg Trials in 1945-46, and the first to prosecute genocide, among other war crimes. ..After a trial lasting more than four years and involving the testimony of nearly 600 witnesses, the ICTY found Mladic, who had been dubbed the “Butcher of Bosnia,” guilty of genocide and other crimes against humanity in November 2017. The tribunal sentenced the 74-year-old former general to life in prison. Coming on the heels of Karadzic’s conviction for war crimes the previous year, Mladic’s long-delayed conviction marked the last major prosecution by the ICTY. Why Do People Still Deny The Holocaust? Like many others, Jews participated in the trans-Atlantic slave trade, but they by no means dominated it. “..The participants in the Atlantic slave system included Arabs, Berbers, scores of African ethnic groups, Italians, Portuguese, Spaniards, Dutch, Jews, Germans, Swedes, French, English, Danes, white Americans, Native Americans, and even thousands of New World blacks who had been emancipated or were descended from freed slaves but who then became slaveholding farmers or planters themselves. “..Henry Ford’s anti-Semitic views echoed the fears and assumptions of many Americans in the late 19th and early 20th centuries. Anti-Semitism in America saw a change in expression and virulence when increased immigration from Europe brought millions of Jews to the U.S. during Ford’s childhood in the latter half of the 19th century. It reached its peak during the mid-1920s: a time when Ku Klux Klanmembership had reached four million, Prohibition restricted alcohol consumption, and discriminatory immigration policies were enacted favoring immigrants from northern and western Europe over other parts of the world. A close friend recalled a camping trip in 1919 during which Ford lectured a group around the campfire. He “attributes all evil to Jews or to the Jewish capitalists,” the friend wrote in his diary. “The Jews caused the war, the Jews caused the outbreak of thieving and robbery all over the country, the Jews caused the inefficiency of the navy…”..
What did the Jewish community think about Ford’s paper? In 1938, Ford received an award from the Nazi regime called the “Grand Cross of the German Eagle.” How do we make sense of this award? What does it mean? The Germans honor Ford, we could say, for a couple reasons. ..
From the point of view of anti-Semitism, Hitler could look at Ford as somebody who was — let’s call him an age-mate. They were both in the 1920s beginning to write and disseminate information about what they both considered to be this great powerful threat, “the Jew.”.. “..It was during the era of the Philippine Commonwealth, 1935–1946, that Jewish refugees from Europe sought a safe haven in Manila. The migration of Jews escaping Europe between 1935 and 1941 was the last major immigration of Jews to the Philippines. The first German Jews to arrive in Manila actually came from the Jewish community in Shanghai. With the occupation of Peking by the Japanese in 1937, the four million inhabitants of Shanghai were endangered. Germany’s shift of alliance from China to Japan at this time alarmed German Jews in Shanghai, fearing German pressure on Japan to adopt Nazi anti-Jewish policies. 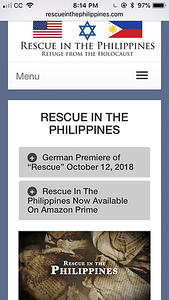 Fearing for them as well, the Jewish Community in Manila, led by the Frieder Brothers of Cincinnati, organized the Jewish Refugee Committee of Manila (JRC) with the intention of rescuing German members of the Shanghai Jewish community. These Jews had already been deprived of their German citizenship, and the Gestapo presence that was taking root in Japanese areas threatened Jewish existence in Shanghai as well. When the Sino-Japanese War broke out in 1937, the JRC received a telegram from Shanghai asking for assistance for Shanghai’s refugee Jews. With the help of Feng-Shan Ho, the Chinese Consul-General in Austria, Austrian Jews were able to escape to other countries, including the Philippines, when Adolf Hitler annexed Austria to Germany in 1938. Manila then received 30 German Jewish refugee families from Shanghai, which then started a larger program that would eventually rescue 1300 refugee Jews from Europe between 1937 and 1941, the largest influx of Jews in Philippine history. ..
“..Mohamed Mohamed is the 32-year-old suspect accused of trying to run down two Jewish men in Los Angeles with his vehicle. The incident happened on November 23, 2018, as the two worshippers left a synagogue in the neighborhood of Hancock Park. .. The FBI has also joined the investigation, as officials look into the suspect’s background. Officials said Mohamed was born in Somalia and had been in the Los Angeles area for only a few days prior to the incident. Pittsburgh synagogue shooting: Who is suspect Robert Bowers? Robert Bowers, 46, of Pittsburgh, the man arrested in the mass shooting Saturday at a Pennsylvania synagogue during a bris, appears to have made virulently anti-Semitic posts on a social media platform popular with far-right extremists, including one made shortly before the attack. The letter, which had 26,000 signatures on Monday morning, said Mr. Trump’s language had given confidence to white nationalists. Some forms of American anti-Semitism have been examined and confronted. Many existed at the local level and had a major impact on Jewish communities all over the U.S. Neutral Perspective: Support or NOT for a Palestinian “State”? Where did the name Palestine come from? In AD 135, the Emperor Hadrian blotted out the name Provincia Judea and renamed it Provincia Syria Palaestina. This was the Latin version of the Greek name and soon became a name to be used as an administrative unit. This name was shortened to Palaestina and the name Palestine was derived from it as a modern and anglicized version. No changes occurred to this name until after the fourth century had passed when Palestine was divided in to three regions, following the imperial reorganization. The name Palestine was used by the Christian Crusades to regard all three of the divided regions in general and continued to be used for the regions on both sides of the Jordan River in general. Palestine went under the rule of the Ottoman Turks for 400 years where its administration was attached to Damascus. After the fall of the Ottoman Empire in World War I, the name Palestine was revived and was applied to the land falling under the British Mandate for Palestine. Arabs use the name Falastinâ for Palestine which is an Arab pronunciation of the Roman word Palaestina. .. “..The Palestinian people does not exist. The creation of a Palestinian state is only a means for continuing our struggle against the state of Israel for our Arab unity. In reality today there is no difference between Jordanians, Palestinians, Syrians and Lebanese. Only for political and tactical reasons do we speak today about the existence of a Palestinian people, since Arab national interests demand that we posit the existence of a distinct “Palestinian people” to oppose Zionism. Yes, the existence of a separate Palestinian identity exists only for tactical reasons, Jordan, which is a sovereign state with defined borders, cannot raise claims to Haifa and Jaffa, while as a Palestinian, I can undoubtedly demand Haifa, Jaffa, Beer-Sheva and Jerusalem. However, the moment we reclaim our right to all of Palestine, we will not wait even a minute to unite Palestine and Jordan. 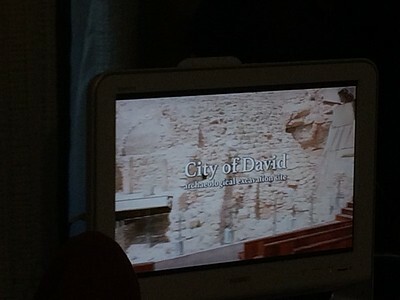 “..Prof. Aviva Halamish of the Department of History, Philosophy and Judaic Studies, opened her lecture on “The True Story of Exodus” by asking if anyone in the audience had any personal connection with the Exodus. Two people raised their hands; one who had a birth certificate indicating that he was one of tens of babies born on the very same embattled ship of Jewish refugees. The real story of the boat known as Exodus is no less astounding and epic in nature than the story portrayed in the 1960 film, by the same name. The Exodus, which departed from France on July 11, 1947, was filled to capacity with 4,500 Jewish refugees, making it the most populous boat to bear refugees to Palestine since the end of the Holocaust. For nearly the entire journey, the Exodus was followed by 6 British ships which, in spite of the Honduras flag which flew from its mast, had early on identified the Exodus as belonging to the struggling Jewish government in Palestine. In addition to the refugees, the Exodus carried 36 American volunteers and a cadre of Israeli Jewish volunteers largely despatched from the Jewish Agency, the official governing body of the Jewish population in Palestine. 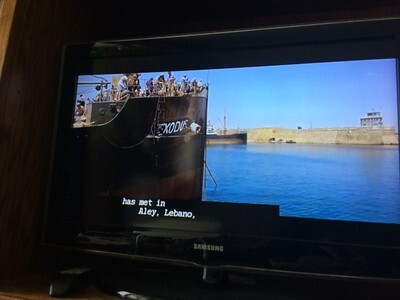 The timing, unlike the portrayal in the film, “had more to do with the Tour de France than the UNSCOP — The United Nations Special Committee on Palestine — which was then visiting Palestine and was chartered to bring its recommendations for resolving the issue of the warring Arab and Jewish populations in Palestine” Prof. Halamish revealed. Why the Tour de France? The Jewish leadership felt that world attention would be riveted more to the Tour de France, than a sole boat chugging its way from France to Haifa. .. 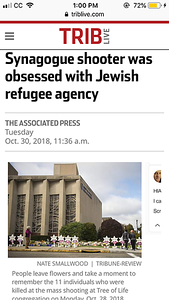 However, and this is one of the other reasons that the story of the Exodus has taken on almost mythic proportions, the British decided that they needed to “teach the refugees,” (and probably the Jewish Agency and its agents throughout the world) “a lesson.” As a result, all of the 4,500+ refugees were reboarded onto three boats to begin a three-day journey back to France. Recognition of a Palestinian state is consistent with the EU’s long-standing support for achieving a two-state solution to the Israeli-Palestinian conflict, and builds on both its landmark 1980 Venice Declaration and subsequent 1999 Berlin statement, which announced the EU’s “readiness to consider the recognition of a Palestinian State”. Three years ago, Vatican officials applauded the U.N.’s move, which gave Palestine the same status as the Vatican before the international organization. In the years since, the Holy See has listed Palestine as a state in its official yearbook, and Pope Francis referred to the Palestinian state during his 2014 visit to the West Bank. But even before U.N. recognition, the Vatican supported the creation of a Palestinian nation. “..On Tuesday, the armed wing of Hamas, the group that administers the Gaza Strip, warned it would increase attacks and fire rockets at the Israeli towns of Ashdod and Beersheba if Israel continues to carry out air raids on civilian buildings. The statement by al-Qassam Brigades was released hours after a rocket from Gaza killed an Israeli man in the coastal town of Ashkelon. At least seven Palestinians have been killed in Israeli attacks since late on Monday, in the worst flare-up of violence between the two sides since the 2014 Israeli assault on the Strip. “..Since Sunday night, Palestinian terrorist groups have fired more than 460 rockets and mortars into Israel. “..The dramatic announcement, a clear sign Israel is preparing for another war against Hamas and the other Palestinian terror groups in Gaza, came after more than 400 rockets rained down on southern Israel since Monday afternoon. The victim appeared to be a Palestinian Arab, 48, from the Hebron area who was only found dead hours after police and the fire brigade arrived at the scene of the devastating blast which destroyed an entire building. The lead up to what could be the third Gaza war began this weekend when a Palestinian terrorist from Gaza infiltrated an Israeli community in the vicinity of the security fence and set ablaze a greenhouse before being arrested by Israeli security forces. The incident was followed by a shoot-out between an elite undercover unit of the IDF and members of Hamas’ military wing Izz-a-Din al-Qassam in the area of the Palestinian town of Khan Younis in Gaza on Sunday night. The secret intelligence-gathering operation went awry when members of Izz-a-Din al-Qassam spotted the IDF unit and tried to stop the private car they were traveling with. In the ensuing shoot-out, 7 Hamas terrorists were killed, among them Nour Barakeh, a Qassam Brigade commander who reportedly was in charge with Hamas’ terror tunnel project and served as the commander of Hamas’ regional battalion in Khan Younis.. The Israeli PM, who on Sunday said he would do his utmost to prevent a humanitarian disaster in Gaza and allowed Qatar to deliver $15 million in cash to the impoverished enclave, immediately started consultations with the top of the IDF after arriving in Israel. A nice little news item where Mark Regev admits Hamas didn’t fire any rockets before Israel broke the cease fire in November. A four-month ceasefire between Israel and Palestinian militants in Gaza was in jeopardy today after Israeli troops killed six Hamas gunmen in a raid into the territory. Until now it had appeared both Israel and Hamas, which seized full control of Gaza last summer, had an interest in maintaining the ceasefire. 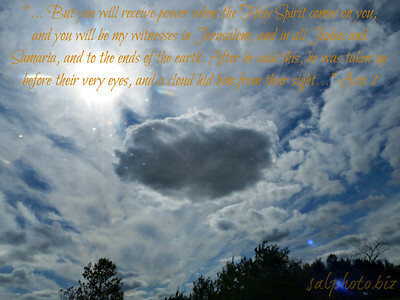 “…Now as you proceed on your chosen path towards your goal I had some questions regarding this future ‘Palestine state’. What will it be like to live in? How will it treat religions other than Muslim? What will its attitude be towards Israel? How will it treat gays, lesbians and cross genders? Will it allow building of places of worship that are not Mosques? What will its policy be towards refugees? Will it have a free press? Which of its Arab ‘brother’ states will it model itself on? Who will be its allies? With whom will it trade? A result of all the research I have conducted, from everything I have read and all that I understand to be spoken by President Abbas and from Khaled Mashal this state will probably not be the nicest of places to live in. Additionally, from current evidence it certainly won’t be democratic as both the PA and Hamas are currently well past their constitutional sell by dates. Furthermore the PA have declared that their state will be a no-go area for Jews and that they will never recognize Israel as the Jewish homeland. 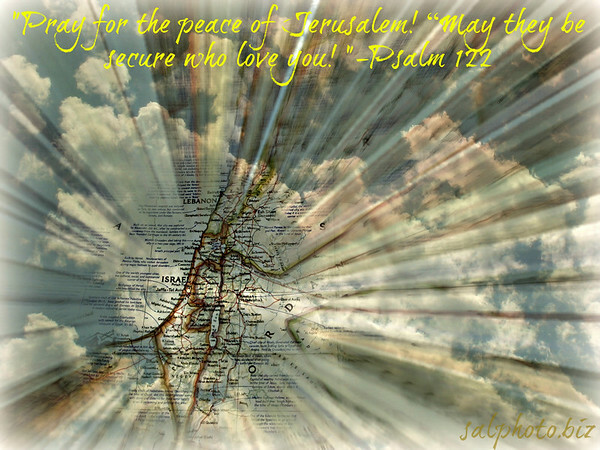 “Jerusalem has been a Jewish holy city since the days of King David . 3000 years ago. In the year 638 CE the muslims captured Jerusalem from the Byzantines and built a mosque on the site of the Jewish holy Temple. While Jews pray facing Jerusalem and the Temple mount , Muslims pray towards Mecca. When Muslims pray in Jerusalem they point their behind to the Dome of the rock and the temple mount. An Islamic holy site ? Palestinians use the temple mount as a playground where they have picnics and play soccer. Sary Nusseibeh , palestinian professor and the president of the Al Quds university had to go underground after admitting that the temple mount is a Jewish holy site. Jerusalem is mentioned in the Bible 667 times , while in the Quran : 0 times . The jews are coming back home from the diaspora . This is an on-going topic, which I’ll be updating this frequently. Stay tune! Thoughts, suggestions, comments, feedback, etc..? “The time of rebuilding the third temple can start now if Israel accepts the truth. 2 “This is what Cyrus king of Persia says: “ ‘The LORD, the God of heaven, has given me all the kingdoms of the earth and he has appointed me to build a temple for him at Jerusalem in Judah. 3 Any of his people among you may go up to Jerusalem in Judah and build the temple of the LORD, the God of Israel, the God who is in Jerusalem, and may their God be with them. 5 Then the family heads of Judah and Benjamin, and the priests and Levites—everyone whose heart God had moved—prepared to go up and build the house of the LORD in Jerusalem. 6 All their neighbors assisted them with articles of silver and gold, with goods and livestock, and with valuable gifts, in addition to all the freewill offerings. 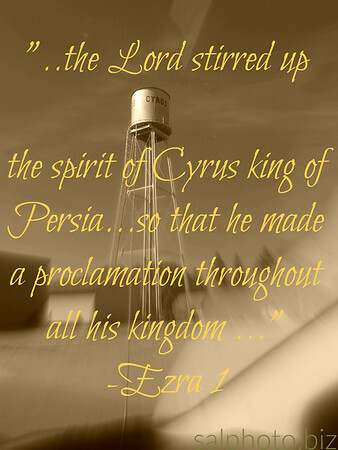 7 Moreover, King Cyrus brought out the articles belonging to the temple of the LORD, which Nebuchadnezzar had carried away from Jerusalem and had placed in the temple of his god. 8 Cyrus king of Persia had them brought by Mithredath the treasurer, who counted them out to Sheshbazzar the prince of Judah. 11 In all, there were 5,400 articles of gold and of silver. 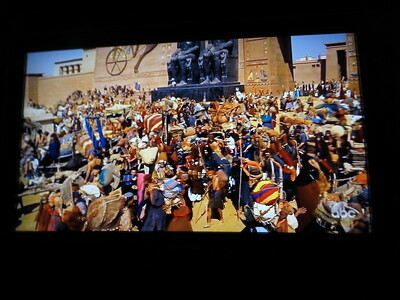 Sheshbazzar brought all these along with the exiles when they came up from Babylon to Jerusalem. Yishai Fleisher (JewishPress.com) takes us on an adventure in the famous Ir Davide (City of David) in Jerusalem. Connections between the history of the Jewish people in Israel and the modern day discovery of archeological evidence. 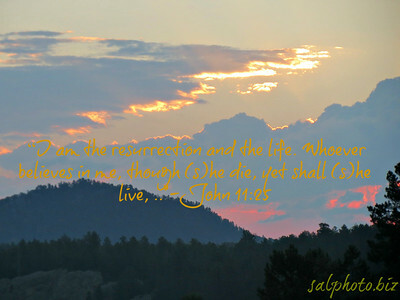 Revealing Astonishing Facts That Will Transform Opinions About the Validity of Christ and the Resurrection. Christ Revealed brings to life the history of Jesus like never before. Walk in the sacred footsteps of Jesus during his ministry. Hear from the best scholars in the world on this subject. We’ll visit the sites of some of the Savior’s most powerful miracles, and discover astonishing facts that prove without a doubt the existence of Christ. In these challenging times of pain and conflict, from Christ Revealed a message of hope and inspiration emerges. No matter what your faith, this documentary will serve as guiding light in your life. “..Tiberias sits off the pebbly beaches of the Kinneret Sea. Built along the shore of the Kinneret (Sea of Galilee), near seventeen natural hot springs, the northern Israeli city of Tiberias is known as the “City of Water.” It is considered one of the four “Holy Cities” in Israel. 00:08 Welcome to Tiberias, one of four very important and holy cities for Jewish people. 00:57 I just arrived to Kinneret lake. 02:02 Beautiful fire colored sky. 02:06 Independence day of Israel 11th May 2016. 02:47 Snake around my hand! 04:16 Memorial of fight in 1948. Brief history. 05:08 One very old mosque. 05:49 Kinneret lake, or Sea of Gallile, the lowest fresh water lake and second lowest lake in world. 08:10 Jewish cemetery and some rules about it. 09:14 Swimming in Jordan river-lowest river in the world. WHERE JESUS CHRIST WALKED ON WATER… – Tiberias, Israel. Jesus Christ was born and raised in Israel. Tiberias is where he walked on water! 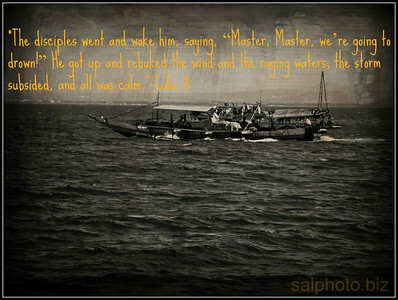 Today we visit the amazing lake also known as the Sea of Galilee. The Sea of Galilee is also known in the Bible as the Sea of Gennesaret, Sea of Tiberias, and Sea of Kinnereth. The Sea of Galilee isn’t really a “sea” per se – it is actually a freshwater lake fed by nearby mountains and springs, which combine at the head of the Jordan River to the north. The Jordan River then passes through the lake, which is about 13 miles long and 8 miles wide. The Sea of Galilee is 686 feet below sea level, making it the lowest freshwater lake in the world. The landscape around the Sea of Galilee is unique. To the east and west, the ground rises steeply from the shore to fertile plateaus above. The black basalt boulders that cover the hillsides are typical of a landscape that was once volcanic. From the southern shore, you can see the twin peaks of Mount Canaan to the north, with the snow-covered Mount Hermon way beyond in the distance. From the west, you can see the small white houses of Ein Gev over on the eastern shore. Beyond Ein Gev rises a hill that was the site of the Hellenistic town, Hippos. 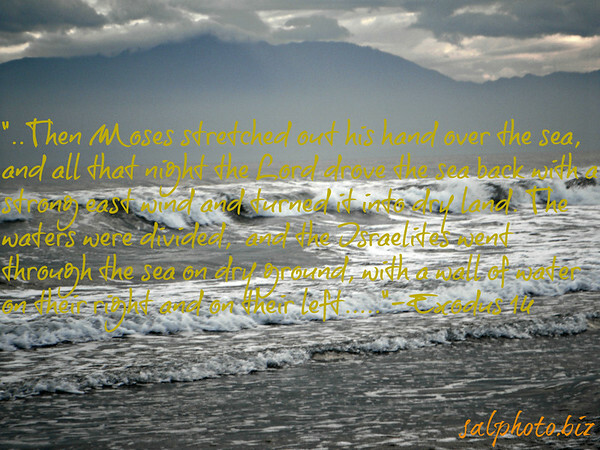 From the east, you can see Magdala Bay on the northwestern shore, which lies just below biblical Tabgha and Capernaum. The land surrounding the Sea of Galilee today appears rather quiet and barren. However, history tells us that this wasn’t the case during the time of Jesus. This was a hub for agriculture and trade. More info about Rick’s travels to Israel: http://www.ricksteves.com/watch-read-&#8230; Galilee is famous as the place where Jesus did his three years of ministry, and where so many Bible stories were set. “2 A man from Levi’s family married a Levite woman. 2 The woman became pregnant and had a son. She saw how beautiful he was and hid him for three months. 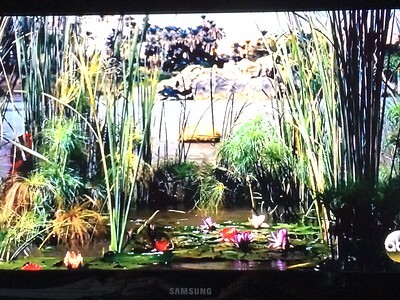 3 When she couldn’t hide him any longer, she took a basket made of papyrus plants and coated it with tar and pitch. 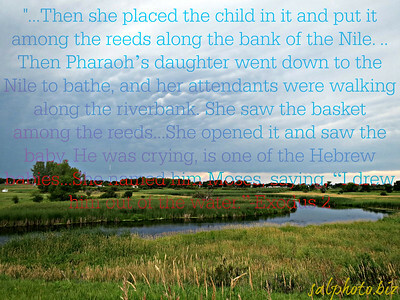 She put the baby in it and set it among the papyrus plants near the bank of the Nile River. 4 The baby’s sister stood at a distance to see what would happen to him. 8 She answered, “Yes!” So the girl brought the baby’s mother. “..Among the prophets mutually revered by Islam and Judaism is the prominent figure of Moses or Musa, peace be upon him (pbuh). A descendant of Joseph, also known as Yusuf, (pbuh), Moses played a definitive role in restoring freedom to the Israelites. 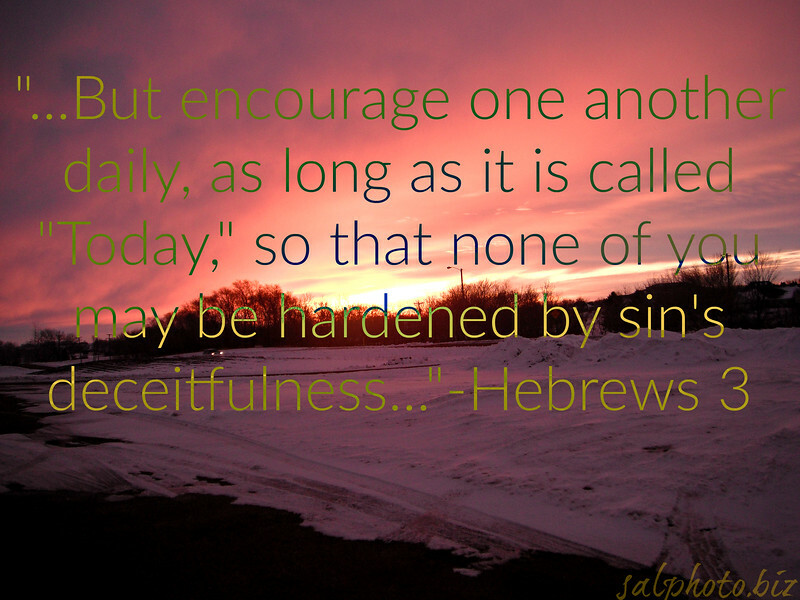 While he encountered many victories, he also experienced hardships in his life…. “.. The Bible says that the Israelites built Raamses, and since Ramesses the second, who began his rule around 1290 B.C., built a royal city named Pi-Ramesses, many just assume him to be the pharaoh of the Exodus. But the Bible never specifically identifies the pharaoh of the Exodus by name, although it does tell us the exact date of the Exodus. 1Kings 6:1 states that Solomon began building the Temple in the fourth year of his reign, 480 years after the Exodus. The temple was started in 1012 B.C., which was derived by adding up .. The calculation is as follows: Total reign of the Judean kings & Solomon = 434 years x 360 day Biblical year/365= 428 years + 587 B.C. = 1015 B.C. the beginning of Solomon’s reign. The temple was started in the 4th year of his reign which would be 1012 B.C. Bishop Usher also calculated 1012 B.C. in his work “Annals of the World” way back in 1650 A.D. 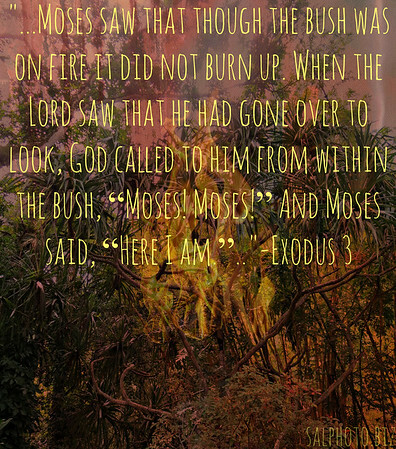 So the approximate date of the Exodus can be calculated: 1012 + (480 x 360 day Biblical year/365) = 1486 B.C. And according to history, Pharaoh Ramesses did not begin his reign until around 1290 B.C., so he couldn’t have been the Exodus pharaoh…. The interesting thing about Avaris was that it was a major city of the “shepherd kings” whom some refer to as “Hyskos” while others refer to them as “Asiatics.” You see Joseph brought his father Jacob and his brothers, who were shepherds, into the land of Egypt and they were given the land of Goshen in which to raise their flocks. 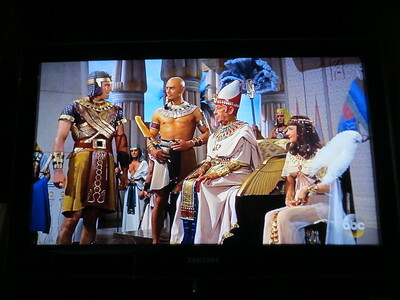 Pharaoh also made them the chief herdsman over all his livestock. Tonight on Shabbat Night Live, you will witness an exclusive broadcast of Ryan Mauro’s documentary on Mount Sinai including spectacular views of the area you have NEVER seen before! “.. 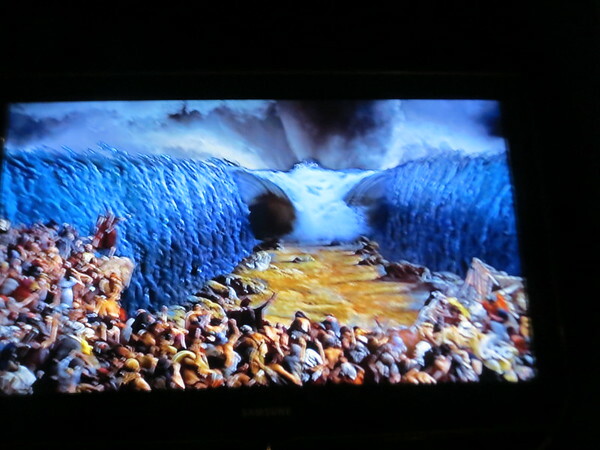 In the Torah account of the story, although Moshe was taken from the Nile by Batya and lived in Pharoah’s house, he continued to maintain a relationship with his birth family –..
3) Moses’ Oratory Skills: Unlike Charlton Heston, a classically-trained, masterful orator, the Torah says that Moshe had a severe speech impediment, and had to relay all of his messages through his brother, Aaron.. The Real Mount Sinai Found! The Ark of the Covenant found!! Deep Thought: Where are the “original” Tribes of Israel? Who were they and where are they now? 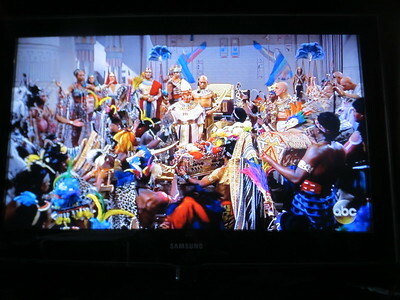 “..After King Solomon died around 922 BCE, the tribes split into two kingdoms as a result of a power struggle. The northern kingdom consisted of Reuben, Dan, Naphtali, Gad, Asher, Issachar, Zebulun, Ephraim, and Menasseh. The southern kingdom was composed of Judah, Simeon, and most of Benjamin (often it was referred to simply as Judah). Where Did the Lost Tribes of Israel Go? Part 1: Kurdistan? Philippines? Africa? While there haven’t been any other major reports of “actual” emissaries from the ten lost tribes, there have been many other supposed discoveries and sightings of the ten lost tribes by travelers and explorers throughout history.27 This has resulted in an abundance of theories, however far-fetched they may be, about their present-day whereabouts. The list includes places such as Africa, Japan, China, India, Afghanistan, Kurdistan, the Caucasus, Yemen, Persia, and even the Americas. “Until they were forced to leave Ethiopia in the 1980s, Ethiopian Jews lived in small villages scattered in the northwestern region of the Ethiopian plateau around Lake Tana and in the Semien mountains area. They traditionally referred to themselves as the Beta Israel, and were referred to by other Ethiopians as Falasha, meaning “strangers” in the indigenous Semitic language Ge’ez. Thus, the term Beta Israel will be used throughout this article to label the community. The community has venerated the Old Testament of the Ethiopian Bible and its religious language has been Ge’ez. Today, the Beta Israel show closest resemblance in external cultural characteristics to their surrounding Habash, i.e. the ethnic category that encompasses the Amhara and Tigray-Tigrinya populations. And although both the Habash-Christians and the Beta Israel claim royal descent from the time of King Solomon and Queen Sheba, an important difference exists (Entine, 2007, p.148-9). While the Christians claim descent from King Menelik—the offspring of Solomon and Sheba in Ethiopia—the Beta Israel claim descent from first-generation Israelites from the tribe of Dan who some believe accompanied Menelik as guards of hono.. 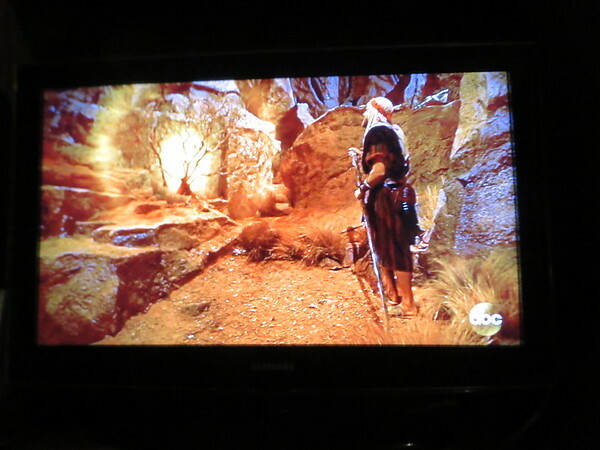 This movie proves that The Ark of The Covenant is neither in Aksum in Ethiopia, nor Rosslyn Chapel in Scotland, and it reveals its true location. 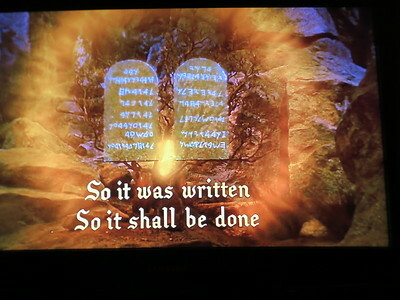 It is compiled from JAH’s research; which can be found throughout this site; and selected and corrected footage from “The Lost Ark” by Bruce Burgess. “..”I am a Jewish Igbo,” he says. The Igbo are one of Nigeria’s largest ethnic groups with population estimates ranging from 20 to 50 million. Abor is convinced that the Igbo’s ancestors were Jews. To believe that the Igbos is one of the lost tribes of Israel might sound ridiculous to a lot of people. But upon factual analysis, one is forced to re-think the possibility of this claim. Known to be third largest of the three major ethnic groups in Nigeria, the typical Igbo communities are found in the southeastern part of Nigeria. And according to oral tradition and many writers of Igbo history, Eri is to the Igbos, what Oduduwa is to the Yoruba. But unlike Oduduwa whose father is unkown, Eri was the fifth son of Gad, the seventh son of Jacob (Genesis 46:15-18 and Numbers 26:16:18). He was said to have migrated from Egypt with a group of companions just before the exodus of the Israelites from Egypt thousands of years ago. “The Lemba people (Vhalemba) from Southern Africa claim to be descendants of a lost tribe which fled from what is now Yemen and journeyed south. DNA testing has genetically linked the Lemba with modern Jews. By contrast, Perez Hamandishe, member of parliament from the Movement for Democratic Change and a pastor in the Pentecostal church, says that the Lemba believe that they are Jews. “We are Jews by blood,” he insists, adding that like the majority of the Lemba, he is Christian by religion, but Jewish by culture. Sam Benatar, president of the Zimbabwe Jewish Board of Deputies, said that there were “all sorts of claims all over Africa by people purporting to be Jewish”, but the Lemba’s belief “may well be true”. Lemba oral tradition, passed on through generations, says they came from the Rabbinical Tribe, the Levites. The Lemba say they fled their original home and traveled to Sena, in modern-day Yemen, where they became traders and craftsmen until they were forced to escape war or natural disaster. This drove the Lemba across the Red Sea to Africa. During their journey down the African continent, tradition says the Lemba built great cities of stone. 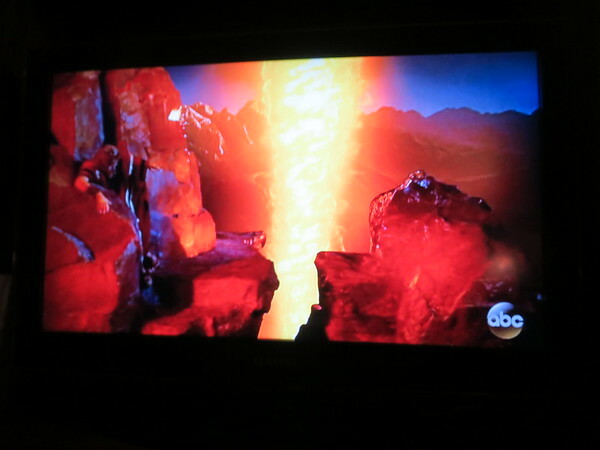 This is where science comes in…. MJBI learned of the Lemba, and has been involved on the ground with them since 2012. At that time, there were no Messianic congregations amongst the Lemba. Today, just five years later, there are now 72 congregations of people meeting on the Sabbath to worship Yeshua the Messiah. Each of them are led by some of the 140 MJBI Lemba graduates. The secretive Lemba observe strict rules that have more in common with norms in Jerusalem than Harare: a ban on pork, ritual slaughter of livestock and male circumcision. “..He is a member of the country’s Lemba tribe, which still observes Jewish traditions. DNA evidence from tribe members show that these traditions were brought here from the Middle East thousands of years ago. .. There is no written history of their forefathers’ passage to what is now Zimbabwe, but the Lemba believe their forefathers arrived with a replica ark – known as the ngoma lungundu – that went missing. “…Among the men, de Torres spoke Hebrew—a great part of Columbus’ belief that he would need someone conversant in Hebrew if or when he encountered members of the ten Lost Tribes. He, and others of his time, firmly believed the stories of the wandering Hebrew children who had, after their Babylonian captivity, migrated throughout Asia and imprinted numerous civilizations with their cultural mores. Today, there are Asian people, mostly Muslim, who light candles on Friday nights but have never known where this custom originated. There is said to be a group in Japan who once a year drive a goat over a cliff in a ceremony that resembles the Yom Kippur service observed by the Jews. God Save America Again documentary (Full) Crusade to Save our Nation! Who are the 12 tribes of Israel today? Mexican Jews Secretly Migrated to New Mexico? Tell Me More. “Listen, listen, people, as you gather together, we will dance before the creator.” This is strongly reminiscent of the Jewish prayer, Shema, which literally means ‘hear’. ..
“Among my people, our ancient name for God is Yah Yah ‘The Supreme Spirit of Spirits’, very similar to Yahweh,” Chief Riverwind explained. “Among my wife’s ancestors, the AniKituwahYah (Cherokee), they called God YoHeWaH. And the similarities don’t stop there. They carried an ark into battle, celebrate seven feasts, kept a seventh day of rest, had cities of refuge, and don’t eat pork.”..
Several explorers, especially during the 17th and 18th centuries, claimed to have collected evidence that some of the Native American tribes might be descended from the Ten Lost Tribes. Several recent books and articles have focused on these theories. Yuchi/Yuchee Indians last seen in Kentucky. They were comprised of two colonies of Jews who left Palestine around 135 AD. “The discovery of the American continent with its various populations generated among the Jews and the Christians alike a number of speculations about the supposed Israelite origin of the American Indians. The Spanish bishop Bartolomeo de Las Casas (1484-1566), a fervent defender of the rights of the native nations of the Americas, forwarded a theory according to which the American Indians were descendants from the Ten Lost Tribes of Israel. The same idea was advanced by some English missionaries. Thomas Thorowgood is his book Jewes in America, or Probabilities that the Americans are of the Race (London, 1650) strongly supported the idea of relating the American Indians to the ancient Israelites. Although Thorowgood’s theory was disputed soon after its publication, among others by members of the clergy, it nevertheless did not loss its attractiveness for other seekers of the Ten Lost Tribes of Israel who continued to raise new ideas and speculations in support of the Israelite origin of all or part of Native American nations in both the Northern and Southern American continents. In South America the hypothesis connecting the American Indians to the Ten Lost Tribes of Israel was advanced mainly by Spanish missionaries and travellers while coming across impressive archaeological remains of the pre-Columbian civilizations or investigating the way of life of local tribes believed to recognize various costumes and beliefs that they related to the Bible and Judaism. Most reports referred to native tribes living in regions that today are part of Bolivia, Ecuador, Venezuela, and Peru, but also in the countries of Central America, especially Mexico. Among the prominent expositors of those theories a mention should be made of Father Diego Duran (d.c.1588), author of The Aztecs: the History of the Indies of New Spain, Father Gregorio Garcia and his Origen de Los Indios de la Nuevo Mundo (Madrid, 1729). The supposed connection between the Ten Lost Tribes of Israel and the Native American nations of North America gained support during the 18th century with the increase of European exploration of the continent. James Adair (1709-1783), a trader with the Indians who lived amongst them for forty years was one of the earliest to believe in a connection between the Ten Lost Tribes and the various Indian tribes of North America, a theory that he formulated in his History of the American Indians (London, 1775). At the same period, this theory also received the support by Charles Beaty, a missionary to the territories west of the Allegheny Mountains, who detailed it in his Journal of a Two Months Tour with a View of Promoting Religion among the Frontier Inhabitants of Pennsylvania, and of Introducing Christianity among the Indians to the Westward of the Allegheny Mountains, (London, 1768). 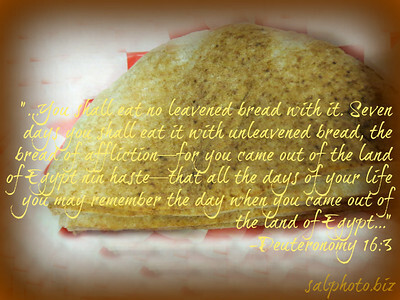 “..Manasseh was fully convinced of the authenticity of the Sambatyon legend. He wrote in his book that all think that the Ten Tribes dwelled beyond this Sabbatical river. He cites many authorities in support of his belief including the statement of Josephus that Titus himself had seen the river. Later on, after his meetings with a remarkable missionary, the Marrano Jew (Jew who was forced to convert to Christianity in Spain and Portugal), Antonio de Montezinus, he became fully convinced that the American Indians constituted some of the Ten Lost Tribes of Israel. In 1587, a Jesuit Nicholas Delttsu was sent to South America by the king of Spain to convert the Indians. 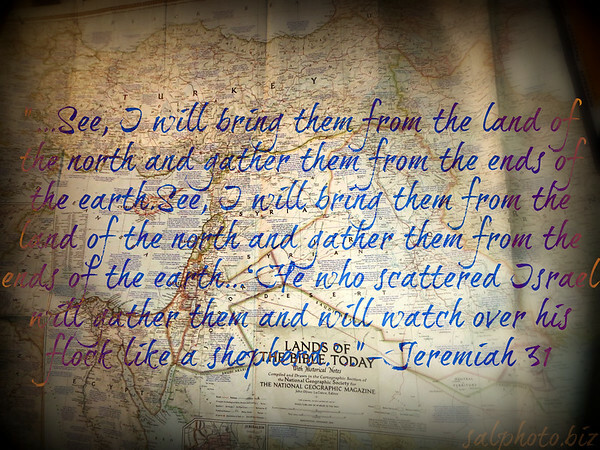 In Argentina, he found a tribe with Hebrew names, Abraham, David, Moshe, etc.. When he asked them if they were circumcised, they answered, “Yes, just as our ancestors.” In the same area were found knives of stone used for circumcision. Sharpened stone knives are cited in the Bible as used for circumcision. Of equal interest is the recent find of a tribe in Argentina related to the Incas of Peru. 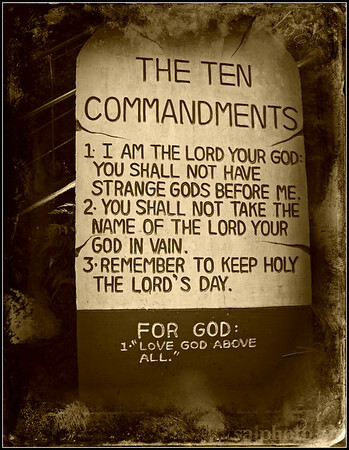 On a stone tablet were found 3 commandments – “Do not steal.” “Do not lie.” and “Do not murder.” Scholars concluded that these commandments come from the Ten Commandments of Moses but existed hundreds of years before the Spaniards arrived. And in 1974 in the same area, round stones were found with Hebrew Menorah (candlestick with 7 arms of ancient Israel) on the stone, and on the side is written in Aramaic, Pascha (Passover). Aramaic is an ancient language which ancient Israelites used and this itself means very old. Though there are only 1,000 Jews in Ecuador, others are increasingly ‘returning’ to the religion. His website, SEMY.com, calls his synagogue both Emunat Yisrael and Emunat Yahshua (Jesus), which can be construed as Messianic. While Franco’s congregation is not on the website list of worldwide Messianic congregations, the rabbi under whom he studied in the US, Caleb Alcala, is on the list…. The Chiang Min people of northwest China claim to be descendents of Abraham. Tradition holds that their forefather had 12 descendents. The Jews of Kaifeng, China According to historical records, a Jewish community with a synagogue built in 1163 existed at Kaifeng from at least the Southern Song Dynasty until the late nineteenth century. A stone monument in the city suggests that they were there since at least 231 BC. “..In the mountainous area of northwest China, west of the Min River, near the border of Tibet, in Szechuan lives the ancient people called by the Chinese, Chiang or Chiang-Min, who numbers about 250 thousand people. The language of the Chiang tribe had been forgotten and they had also lost their ancient script. Today they speak Chinese. This God gives them the opportunity to do repentance and to gain atonement for their actions. In times of trouble, they call God in the name of “Yawei”, the same as Yahweh. These priests wear clean white clothes and perform the sacrifices in a state of purity as the priests in ancient Israel did (1 Samuel 15:27). I recall that Japanese Shinto priests also wear clean white clothes at holy events. “I have mentioned above about the people of the Yusufzai and the Pathans in Afghanistan and Pakistan, the people of Kashmir, the Menashe tribe in India and Myanmar, and the Chiang (Chiang-Min) tribe in China. These places are all along the Silk Road. Are these all where they went? Otherwise, were there any other people who went further east along the Silk Road? Where is the destination of the Silk Road? Japan. Did the Ten Tribes of Israel come to Japan? 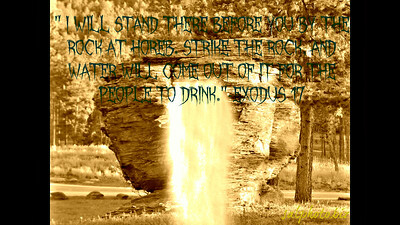 However, it was not a big problem for the Israelites. Scholars say that Israelites already traded in the time of King Solomon (the 10th century B.C.E.) with India and other countries of the Mediterranean Sea with a fleet of ships (see 1 Kings 10:22, Some of the words are from Sanskrit). Israelites knew well about ships even in the times before the country of Japan started..
Engelbert Kaempfer was a German medical doctor who stayed at Dejima, Nagasaki Japan during 1690-1693 C.E.. He came to Japan after he traveled and saw various countries of the world. He was an erudite man and published a book about Japan after he went back to Europe. Some writers have speculated that the Japanese people themselves may be direct descendants of part of the Ten Lost Tribes. There are some parallels between Japanese and Israelite rituals, culture, traditions, and language, which provide some evidence for this possibility. An article that has been widely circulated and published, entitled “Mystery of the Ten Lost Tribes: Japan” by Arimasa Kubo (a Japanese writer living in Japan who studied the Hebrew Bible), concludes that many traditional customs and ceremonies in Japan are very similar to the ones of ancient Israel and that perhaps these rituals came from the religion and customs of the Jews and the Ten Lost Tribes of Israel who might have come to ancient Japan. Joseph Eidelberg’s “The Biblical Hebrew Origin of the Japanese People” makes a similar case: Late in his life, Joseph Eidelberg began analyzing ancient traditions, religious ceremonies, historical names, haiku poems, Kana writings and Japanese folk songs, discovering thousands of words with similar pronunciations, sounds and translations between Hebrew and Japanese. These discoveries are history in the making, giving credible new information on the meanings of many unknown Japanese words, numbers, songs and cultural traditions – and this book is the first time that these remarkable similarities are combined into a single consistent theory…. Israel Scattered Amongst the Chinese and Japanese! Some Information in this video came from a book called “The World of Ancient China” and maps from”The Lost Tribes A Myth” by Godbey (Harvard University). “..In the book Isaiah we find the Hebrew name Sinim. Sin is Hebrew name for China. 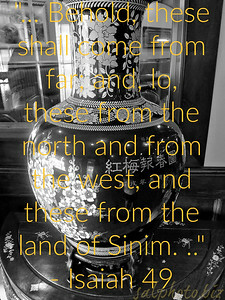 And the inhabitants (Chinesare called “Sinim”. The verse reads:..
Torrance notes that the Chiang-Min “…retain unquestionable marks of being members of the Israelitish branch of the Semitic race…”..
among them unmistakable Semitic features. He finds many customs common to ancient Israelite religion. The Chiang-Min believe in one God and serve the Abbah Molan, reminiscent of the Israelite Malach or messenger of God (angel). “In times of calamity or acute distress, the people have a moan or cry of a ‘Yawei’ sound – very suggestive…of the Biblical name of G’d.” .. Standing at the magnificent and historic Great Wall of China (built by the emperor Qin Shi Huang during the Qin dynasty 260 BC-210 BC), this video reveals the divine mission of this most important information regarding the Lost Tribes of Israel pursuant to their travel along the Silk Route through ancient Persia, modern day Afghanistan and India, integrating into the Chinese culture and population approximately 800 years before the birth of the Messiah Yahushua. Traces of some ancient Jewish rituals have been observed in some places. Lost Tribes of Jews from China. This is the Reason why Jesus had to come to Asia, to teach the Lost Tribes of Israel. The life, Death and Tomb of Jesus are proofs that Jesus was only a Humble Prophet of God, Not the So of God, Was Crucified but Survived Crucifixion, Migrated to Asia to teach the Lost Tribes of Israel and Died like a Normal Human Being in Kashmir India. 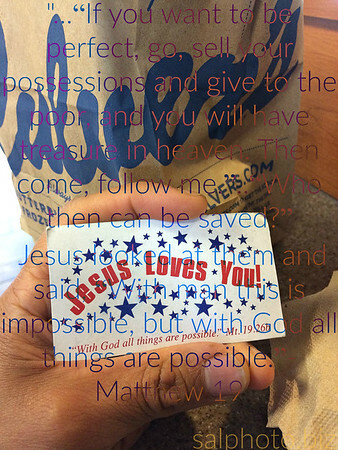 Visit http://www.tombofjesus.com to know more about this Truth. 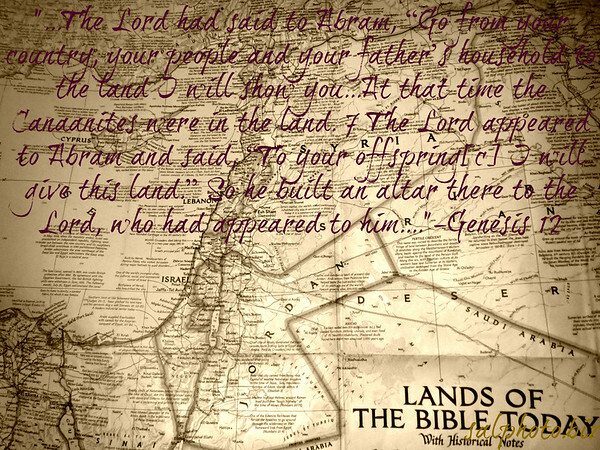 Where Did the Lost Tribes of Israel Go? Part 2A: Ophir, Philippines? “..The Tribe of Dan had been carried off by the Assyrians (modern day Germans and Austrians). But when the Babylonians destroyed Assyria, the slave tribes scattered. Dan headed northwest. Several theories claim that the Scythians and / or Cimmerians were in whole or in part the Lost Tribes of Israel. The theories are generally based on the belief that the Northern Kingdom of Israel, which had been deported by the Assyrians, became known in history as the Scythians and / or Cimmerians. Various points of view exist as to which modern nations these people became. The Behistun Inscription is often cited as a link between the deported Israelites, the Cimmerians and the Scythians (Saka). George Rawlinson wrote: We have reasonable grounds for regarding the Gimirri, or Cimmerians, who first appeared on the confines of Assyria and Media in the seventh century B.C., and the Sacae of the Behistun Rock, nearly two centuries later, as identical with the Beth-Khumree of Samaria, or the Ten Tribes of the House of Israel. Adherents often believe that the Behistun Inscription connects the people known in Old Persian and Elamite as Saka, Sacae or Scythian with the people known in Babylonian as Gimirri or Cimmerian. It should be made clear from the start that the terms ‘Cimmerian’ and ‘Scythian’ were interchangeable: in Akkadian the name Iskuzai (Asguzai) occurs only exceptionally. Gimirrai (Gamir) was the normal designation for ‘Cimmerians’ as well as ‘Scythians’ in Akkadian. Critics of the Israel / Scythian theory argue that the customs of the Scythians and Cimmerians contrast those of the Ancient Israelites and that the similarities and theories proposed by adherents stand in contradiction to the greater body of research on the history of ancient populations, which does not provide support for the purported links between these ancient populations.. The spatial arrangement of Dan, Asher, and Naphtali in the Land of Israel was repeated after the tribes had moved westward and settled there. We find Dan in Denmark, Naphtali in Norway, Asher in Scandinavia in general (as the As, Aseir, as well as in Sweden). 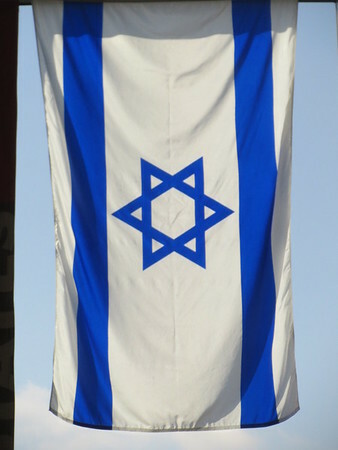 The Bene Israel (Hebrew: “Sons of Israel”) are a group of Jews who live in various Indian cities, Mumbai, Pune, Ahmadabad, and in Pakistan such as in Karachi, Peshawer and Multan. Straddling the boundaries between Afghanistan, Pakistan and Kashmir lives the world’s largest tribal grouping—the Pathans. All of the 15 million Pathans, who comprise some 60 tribes, claim descent from Kish, an ancestor of the Biblical King Saul. Many of them also claim to be them children of the Lost Israelites. The Pathans perform circumcision of the eighth day, wear a fringed garment similar to the Jewish tzizit, light candles on Friday nights and observe food taboos similar to the laws of Kashrut. Kashmir is renowned as one of the most spectacularly beautiful places in the world. Kashmir consists of a wide and beautiful valley, surrounded by tall mountains and is one of the most beautiful places in the world. There have been many controversies regarding its history. Till now many references about the origin of Kashmiri people have been given but controversies are still present. One such theory is about kashmiries being the Lost Tribe of one of the twelve tribes of Bani-Israel . The history of the Kashmir is shrouded in mystery, as is the history of other people in Kashmir. Many researchers are of the opinion that many inhabitants of Kashmir are descendants of the Lost Tribes who were exiled in 722 BC. They wandered along the Silk Road into the countries of the East, Persia and Afghanistan until they reached the Kashmir valley and settled there. 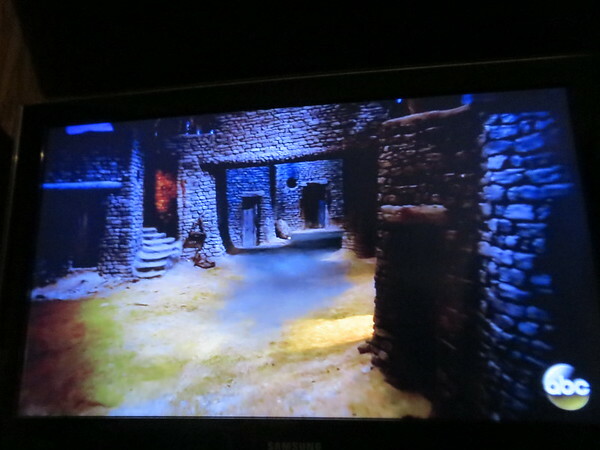 Others say the wanderings began approximately 300 years later. The wanderers settled in Kashmir, kept their traditions until they slowly started idol worship and gradually got converted to Hinduism & ultimately they got converted to Islam when the word of Allah (Islam) reached the valley and thus once again started worshiping the one GOD “ALLAH”. There are 5 to 7 million people here. Generally speaking, they have clearer complexions and are different from the other citizens of India. The Pashtun, an Iranic ethnic group of 50 million Muslims living, refer to themselves as the “Bani Israel,” very similar phonetically to the Hebrew term for the “children of Israel,” Bnei Yisrael. “The Pashtun have an intricate and strong tribal system and are meticulous about family genealogy (Shijra), but within this tribal framework is a strong oral tradition that they are descended from the lost Ten Tribes of Israel,” Sofy explained to Breaking Israel News. “..Pashtun (also spelled Pushtun, Pakhtun, Pashtoon, Pathan) are a people who live in southeastern Afghanistan and the northwestern province of Pakistan. They are one of the largest ethnic groups in Afghanistan. There is no true written history of the Pashtun in their own land. Pashtun are traditionally pastoral nomads (herders who move frequently to find grazing land) with a strong tribal organization. Each tribe is divided into clans, subclans, and patriarchal families. Rabbi Harry Rozenberg interviews the famed traveler Amir Dromi on his travels across the Silk Road in search of a very specific remnant of the ancient Israelite exile; The Bnei Moshe (the children of Moses). This specific family was said to have been in hiding for thousands of years in a location behind the River Sambatyon. Watch and listen to the incredible journey Amir undertook in search of these Tribes. …Pashtuns of the Afghan region: Is One of the Lost Tribes the Taliban? “The Pashtuns are a predominantly Muslim people, native to Afghanistan and Pakistan, who adhere to their pre-Islamic indigenous religious code of honour and culture Pashtunwali. They traditionally claim descent from the Lost Tribes. The Yousafzai (Yusafzai) are a large group of Pashtun tribes. Their name means “Sons of Joseph”. There are also similar names in other areas of the region, such as the disputed land of Kashmir. 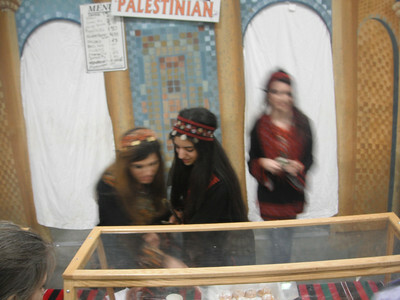 There are a variety of cultural and ethnic similarities between Jews and Pashtuns. A visit by a Western journalist in 2007 revealed that many currently active Pashtun traditions may have parallels with Jewish traditions. The code of Pashtunwali is strikingly similar in content and subject matter to the Mosaic law. A book which corresponds to Pashtun historical records, Taaqati-Nasiri, states that in the 7th century a people called the Bani Israel settled in Ghor, southeast of Herat, Afghanistan, and then migrated south and east. These Bani Israel references are in line with the commonly held view by Pashtuns that when the twelve tribes of Israel were dispersed, the tribe of Joseph, among other Hebrew tribes, settled in the region. Hence the tribal name ‘Yusef Zai in Pashto translates to the ’sons of Joseph’. This is also described extensively in great detail by Makhzan-i-Afghani, a historical work from the 17th Century by Nehamtullah, an official in the royal court of Mughal Emperor Jehangir. A similar story is told by Iranian historian Ferishta. This account is also substantiated by the fact that the Bnei Menashe of India also have traditions which trace their wanderings as going originally from the Persian Empire to Afghanistan. In their case, they then went to China, where they encountered persecution, then pressed on to India and Southern Asia. The Bani-Israelite theory about the origin of the Pashtun is based on Pashtun traditions; the tradition itself is documented in a source titled Makhzan-i-Afghani, the only written source addressing Pashtun origins. It was written in 1612, by Nematullah Harvi, a scribe at the court of Mughal Emperor Jehangir of Hindustan. The Iranian Persian Race Is A Mongol Türk Yewish Mix From Mesopotamia They Went To The Arab Area And To Europ. “..The great medieval Jewish traveler is familiarly known as Benjamin of Tudela. We know little about him other that what emerges in his famous Book of Travels. In whichever community he visited, and even in those he didn’t, Benjamin recorded his observations, many of which are quite imaginative. ..I. THE ORIGIN OF BRITISH ISRAELISM. 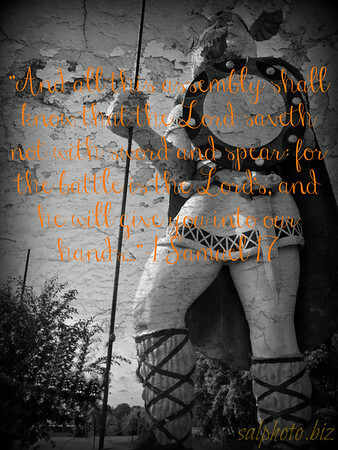 The most celebrated Danite was Samson, who some suggest is derived from Danyen tribal legends. The anti-Christ is also said to be a member of the tribe of Dan. Today, when we remember the feast of St. Patrick, we remember more than just the coming of Christianity to Ireland. “..“So where do these Kurds come from? One theory is that they may actually be the 10 lost tribes of Israel. The Jews of today are descended from the two southern tribes (Judah and Benjamin), but the ten northern tribes were conquered by Assyria in the 8th century B.C., and settled in the exact same area where the Kurds dwell. The Yazidi religion traces their descent from Adam, moreover they have a yearly pilgrimage in the month of September/October, which is the same time as one of the Jewish festivals required Jews to attend the temple in Jerusalem.” ..
Further, regarding this search for ethnic groups which might belong to the “lost” tribes: According to the biblical criteria – see for instance Deuteronomy 28:64 and 65 with their context – those groups must be (relatively) few in number, and again, they would not have a country of their own. Some have promoted the notion that the Kurds represent a Lost Tribe. Some claims have been made regarding a genetic relationship between the Kurds and the Jews on the basis of a similarity between Kurdish Y-DNA and a Y haplotype that is associated with the Jewish priesthood. 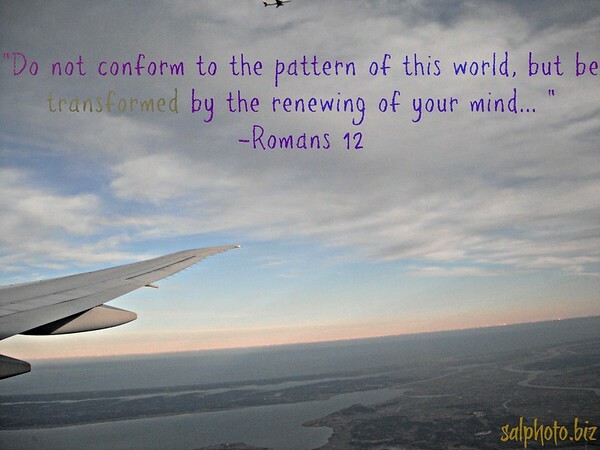 “It’s time for the final migration of the Southern Kingdom in which Isaiah, Zephaniah, etc. tell us went into Africa. Notice neither of these 3 groups migrated into the Russian Steppes nor Europe as traditional tells us and this according to scripture. Review all the evidence from ancient maps, history and language and see how they support the Bible. Enjoy the journey. Most Ashkenazi Jews, traditionally believed to have descended from the ancient tribes of Israel, may in fact be maternally descended from prehistoric Europeans. “..The majority of Ashkenazi Jews are descended from prehistoric European women, according to study published today (October 8) in Nature Communications. While the Jewish religion began in the Near East, and the Ashkenazi Jews were believed to have origins in the early indigenous tribes of this region, new evidence from mitochondrial DNA, which is passed on exclusively from mother to child, suggests that female ancestors of most modern Ashkenazi Jews converted to Judaism in the north Mediterranean around 2,000 years ago and later in west and central Europe. “..Tradition holds, though, that Ashkenazi Jews ultimately trace their origins straight back to ancient Israel, whence most Jews were expelled en masse in 70 CE by their Roman conquerors and sent skittering to all parts of the globe. (Jews who initially fled to Spain and Portugal are referred to as Sephardic. Those who took up residence in Iran, Iraq and Northern Africa are designated as Mizrahi.).. Plausible at the time, the Khazar-origin premise has crumbled under the onslaught of modern molecular genetics. The latest volley: a study published this week in Nature Communications. The study’s senior author, Stanford geneticist Peter Underhill, PhD, works in the lab of Carlos Bustamante, PhD, whose high-resolution techniques have highlighted the historical hopscotch of other migratory peoples. “…Today there are more than 10 million Ashkenazi Jews around the world, including 2.8 million in Israel, according to the Hebrew University of Jerusalem. “..If you ever get your DNA tested, you might be surprised to discover a certain percentage of Ashkenazi Jewish DNA. Many people with European ancestry who are not practicing Jews and know of no Jewish ancestors do discover some Ashkenazi in them. There is a lengthy discussion on the topic on 23andme.com, a popular DNA testing site. People are using the discussion to try to determine their Jewish ancestors and their origins after discovering they are descended from some of the Ashkenazi population. Here’s what you need to know about the Ashkenazi Jewish people, and how they are different genetically from the general Jewish community. The name Ashkenazi comes from a Biblical person named Ashkenaz. He was the eldest son of Gomer. 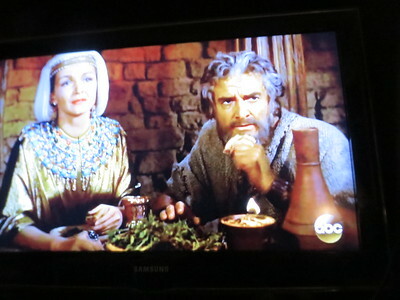 Gomer was a grandson of Noah through Noah’s son Khaphet. This makes Ashkenaz a great-grandson of Noah. The Jewish population in eastern and central Europe began being distinguished from the Holy Land Jewish people by the use of the name Ashkenazi in the early Medieval period of history. There was a Christian custom at this time of calling areas of Jewish settlement in Europe with Biblical names, which is how the Ashkenzazis received their name. By the later Medieval period, the term Ashkenazi was used for the German and French Jewish populations alone and was even adopted by the Jewish people and scholars of the area themselves. It was only with the rise of Emperor Charlemagne, who joined the mini-kingdoms of France into one country in 800 A.D. that the history of the Ashkenazi Jewish people in Europe becomes well documented. Charlemagne gave them the same freedoms they once enjoyed under the Romans, and they began opening businesses in finance and commerce. They also got into banking, as Christians were prohibited from charging interest by their religion. By the 11th century A.D., the Ashkenazi Jewish people were well known for their Talmudic studies and halakhic learning. They were also criticized by Jewish people in the Holy Land for their lack of knowledge in traditional Jewish law and the Hebrew language. They spoke Yiddish instead, which was a combination of traditional Hebrew and various German dialects from the communities in which they lived. The Yiddish language was still written with Hebrew letters, however, while also being influenced with Aramaic. Now You Know: What is “discipleship”? 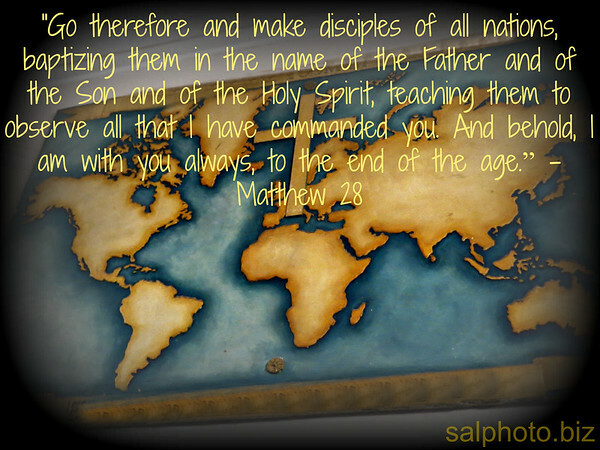 The Greek word that’s translated “make disciples” is mathēteuō, which comes from the root mathētēs, meaning “learner” or “pupil.” In ancient Greece, this word typically denoted someone who was an apprentice to a trade like masonry or shipbuilding. In philosophy, it spoke of someone who had developed a master/student relationship with a teacher. What’s your thoughts of these definitions or descriptions above? “..In Revelation 21:14 we are told that the twelve foundations of the wall of the New Jerusalem will have in them the names of the twelve disciples/apostles. It is evident, therefore, that God attaches great importance to these 12 men. They were unlikely leaders. As the Bible tells it, most knew more about mending nets than winning converts when Jesus said he would make them “fishers of men.” Yet 2,000 years later, all over the world, the Apostles are still drawing people in. “IN THE TOWN of Parur, India, in the southern state of Kerala, the polished stone floor of the old church of Kottakkavu gleams so brightly that it mirrors the crimson, pine green, and gold-upon-gold altarpiece like a reflecting pool. “..Around the altarpiece, painted clouds hover in a blue sky. Small statues stand in niches backlit with brilliant aqua. On a rug near the church wall a woman in a blue sari with a purple veil covering her hair kneels motionless, elbows at her sides, hands upraised. 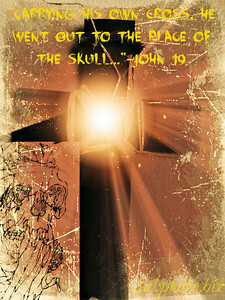 In a larger, newer church adjacent, a shard of pale bone no bigger than a thumbnail lies in a golden reliquary. A label in English identifies the relic as belonging to St. Thomas. On this site, tradition says, Thomas founded the first Christian church in India, in A.D. 52. Tradition holds that 11 of the Twelve Apostles were martyred. 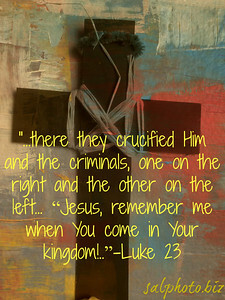 Peter, Andrew, and Philip were crucified; James the Greater and Thaddaeus fell to the sword; James the Lesser was beaten to death while praying for his attackers; Bartholomew was flayed alive and then crucified; Thomas and Matthew were speared; Matthias was stoned to death; and Simon was either crucified or sawed in half. John—the last survivor of the Twelve—likely died peaceably, possibly in Ephesus, around the year 100. “..Mark the Evangelist too spread the word, bringing Christ’s message to Egypt and founding the Coptic faith. But for some Catholics, Mark represents most emphatically the saint as political symbol, powerfully linked with the identity of Venice. Although a figure from the ancient past, he retains a stronger grip on the consciousness of modern-day Venetians than Washington or Lincoln holds on most Americans. “..The largest Christian community in the Middle East, Coptic Christians make up the majority of Egypt’s roughly 9 million Christians. About 1 million more Coptic Christians are spread across Africa, Europe, the United Kingdom and the United States, according to the World Council of Churches. Coptic Christians base their theology on the teachings of the Apostle Mark, who introduced Christianity to Egypt, according to the St. Takla Church in Alexandria, the capital of Coptic Christianity. This information is based on the research of Dr. Herman Hoeh from an Article called “Where did the apostles go?” It was co-authored by John Keyser. First, Paul was to teach the Gentiles – he did that in Cyprus, Asia Minor and Greece. Second, he was to appear before kings – an event which landed him in prison in Rome for two-years. At the end of that two-year period, during which no accusers had appeared, Paul would automatically have been released according to Roman law. At that point, Luke stops the story of Paul. See Acts 28:31. Thirdly, he ended his work by going to the Lost Ten Tribes. “..Andrew went to Scythians. Andrew had Scythia, and the neighboring countries primarily allotted him for his province. “went next to Trapezus, a maritime city on the Euxine Sea, whence after many other places he came to Nice, where he stayed two years, preaching and working miracles with great success: thence to Nicomedia, and so to Chalcedon; whence sailing through the Propontis he came by the Euxine Sea [BLACK SEA] to Heraclea, and from thence to Amastris..
“directed his journey toward Egypt, then to Cyrene, and Africa … and throughout Mauritania and all Libya.. There were 2 apostles named James. James of Alphaeus went to Spain. James, the brother of the Messiah, was martyred by Herod. (Acts 12:2). James, son of Alphaeus, was the one who left Palestine after the first twelve years. The deeds of this apostle are sometimes mistakenly assigned to James, John’s brother. Philip was assigned to Scythia. Scythia was the land area located aroung the Black and the Caspian Seas. In 331 A.D. the Parthian Empire fell to Persia. The Parthians migrated to this region. Metaphrastes was the principal compiler of the legends of saints in the “Menologia” of the Byzantine Church. Also Dorotheus declares Matthew was buried at Hierapolis in Parthia.
. sources designate Dacia. Dacia was the extreme western part of Scythia. From Dacia came the Normans who ultimately settled in France and Britain. John may have been sent to Gaul which is modern day France. 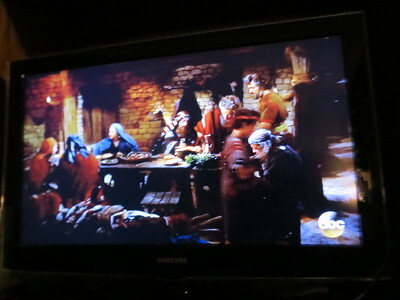 This is only based on a French legend that Mary mother of Jesus went to Gaul. We know that the Messiah told John to take care of his mother. There is a legend that Mary went with John to France and later to Britain. Paul may have passed by Gaul on his way from Italy to Spain (Romans 15:24, 28). This is no historical proof that John went to Gaul.